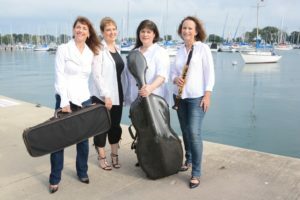 Recognized as one of Chicago’s finest chamber music groups, ORION ENSEMBLE is the winner of the prestigious Chamber Music America/ASCAP Award for Adventurous Programming. John von Rhein of The Chicago Tribune calls Orion “one of Chicago’s most vibrant, versatile and distinctive ensembles.” Orion offers exciting interpretations of standard repertoire, introduces audiences to rarely-performed masterpieces, and inspires composers to write new works. Orion Ensemble unites four distinguished concert artists who have performed throughout North America, Europe, and Asia, as an ensemble and individually in solo, orchestral, and other chamber music roles. Renowned for their expressive cohesiveness and creativity developed over 24 years together, Orion’s unique dedication to this intimate art form contributes to its preservation and accessibility, inspiring audiences of all ages, as well as composers and young musicians. 2017 is the 11th year Orion has been with the OPUS Camp. The Orion Ensemble is celebrating their exciting 25th season in 2018! To celebrate this milestone, Sebastian Huydts, one of their favorite composers, is writing a world premiere and they will be sharing some of their best-loved repertoire from past seasons. They feel blessed to have made music together for 25 years, growing into the chamber music family they are today, and they look forward to seeing you at each of their concerts! Join them for this fantastic new season, full of great music and extraordinary guest artists. Orion Member Cellist Judy Stone coaching a string quartet during OPUS Chamber Music Camp (left). The camper quartet performs IV. Presto, Quartet in D Major, op. 20, no. 4 by Franz Joseph Haydn in the Camp’s final concert (right). Visit the Orion Ensemble website.